A spark gap consists of an arrangement of two conducting electrodes separated by a gap usually filled with a gas such as air, designed to allow an electric spark to pass between the conductors. When the potential difference between the conductors exceeds the breakdown voltage of the gas within the gap, a spark forms, ionizing the gas and drastically reducing its electrical resistance. An electric current then flows until the path of ionized gas is broken or the current reduces below a minimum value called the "holding current". This usually happens when the voltage drops, but in some cases occurs when the heated gas rises, stretching out and then breaking the filament of ionized gas. Usually, the action of ionizing the gas is violent and disruptive, often leading to sound (ranging from a snap for a spark plug to thunder for a lightning discharge), light and heat. Spark gaps were used historically in early electrical equipment, such as spark gap radio transmitters, electrostatic machines, and X-ray machines. Their most widespread use today is in spark plugs to ignite the fuel in internal combustion engines, but they are also used in lightning arresters and other devices to protect electrical equipment from high-voltage transients. The light emitted by a spark does not come from the current of electrons itself, but from the material medium fluorescing in response to collisions from the electrons. When electrons collide with molecules of air in the gap, they excite their orbital electrons to higher energy levels. When these excited electrons fall back to their original energy levels, they emit energy as light. It is impossible for a visible spark to form in a vacuum. Without intervening matter capable of electromagnetic transitions, the spark will be invisible (see vacuum arc). Spark gaps are essential to the functioning of a number of electronic devices. A spark plug. The spark gap is at the bottom. A spark plug uses a spark gap to initiate combustion. The heat of the ionization trail, but more importantly, UV radiation and hot free electrons (both cause the formation of reactive free radicals) ignite a fuel-air mixture inside an internal combustion engine, or a burner in a furnace, oven, or stove. The more UV radiation is produced and successfully spread into the combustion chamber, the further the combustion process proceeds. Spark gaps are frequently used to prevent voltage surges from damaging equipment. Spark gaps are used in high-voltage switches, large power transformers, in power plants and electrical substations. Such switches are constructed with a large, remote-operated switching blade with a hinge as one contact and two leaf springs holding the other end as second contact. If the blade is opened, a spark may keep the connection between blade and spring conducting. The spark ionizes the air, which becomes conductive and allows an arc to form, which sustains ionization and hence conduction. A Jacob's ladder on top of the switch will cause the arc to rise and eventually extinguish. One might also find small Jacob's ladders mounted on top of ceramic insulators of high-voltage pylons. These are sometimes called horn gaps. If a spark should ever manage to jump over the insulator and give rise to an arc, it will be extinguished. Smaller spark gaps are often used to protect sensitive electrical or electronic equipment from high-voltage surges. In sophisticated versions of these devices (called gas tube arresters), a small spark gap breaks down during an abnormal voltage surge, safely shunting the surge to ground and thereby protecting the equipment. These devices are commonly used for telephone lines as they enter a building; the spark gaps help protect the building and internal telephone circuits from the effects of lightning strikes. Less sophisticated (and much less expensive) spark gaps are made using modified ceramic capacitors; in these devices, the spark gap is simply an air gap sawn between the two lead wires that connect the capacitor to the circuit. A voltage surge causes a spark that jumps from lead wire to lead wire across the gap left by the sawing process. These low-cost devices are often used to prevent damaging arcs between the elements of the electron gun(s) within a cathode ray tube (CRT). Small spark gaps are very common in telephone switchboards, as the long phone cables are very susceptible to induced surges from lightning strikes. Larger spark gaps are used to protect power lines. Spark gaps are commonly implemented on Printed Circuit Boards in mains power electronics products using two closely spaced exposed PCB traces. This is an effectively zero cost method of adding crude overload protection to electronics products. Transils and trisils are the solid-state alternatives to spark gaps for lower-power applications. Neon bulbs are also used for this purpose. A photo of a Smith & Wesson firing, taken with an air-gap flash. The photo was taken in a darkened room with the camera's shutter open, and the flash was triggered by the sound of the shot using a microphone. A triggered spark gap in an air-gap flash is used to produce photographic light flashes in the sub-microsecond domain. A spark radiates energy throughout the electromagnetic spectrum. Nowadays, this is usually regarded as illegal radio frequency interference and is suppressed, but in the early days of radio communications (1880–1920), this was the means by which radio signals were transmitted, in the unmodulated spark-gap transmitter. Many radio spark gaps include cooling devices, such as the rotary gap and heat sinks, since the spark gap becomes quite hot under continuous use at high power. A calibrated spherical spark gap will break down at a highly repeatable voltage, when corrected for air pressure, humidity and temperature. A gap between two spheres can provide a voltage measurement without any electronics or voltage dividers, to an accuracy of about 3%. A spark gap can be used to measure high voltage AC, DC, or pulses, but for very short pulses, an ultraviolet light source or radioactive source may be put on one of the terminals to provide a source of electrons. Spark gaps may be used as electrical switches because they have two states with significantly different electrical resistance. Resistance between the electrodes may be as high as 1012 ohms when the electrodes are separated by gas or vacuum which means that little current flows even when a high voltage exists between the electrodes. Resistance drops as low as a 10-3 ohms low when the electrodes are connected by plasma which means that power dissipation is low even at high current. This combination of properties has led to the use of spark gaps as electrical switches in pulsed power applications where energy is stored at high voltage in a capacitor and then discharged at high current. Examples include pulsed lasers, railguns, Marx generators, fusion, ultrastrong pulsed magnetic field research, and nuclear bomb triggering. Triggered spark gaps are a class of devices with some additional means of triggering to achieve low jitter. Most commonly, this is a third electrode, as in a trigatron. The voltage of the trigger electrode can be changed quickly because the capacitance between it and the other electrodes is small. In a triggered spark gap, gas pressure is optimized to minimize jitter while also avoiding unintentional triggering. Triggered spark gaps are made in permanently sealed versions with limited voltage range and in user-pressurized versions with voltage range proportional to the available pressure range. Triggered spark gaps share many similarities with other gas-filled tubes such as thyratrons, krytrons, ignitrons, and crossatrons. 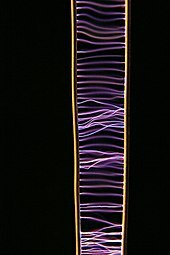 A Jacob's ladder (more formally, a high voltage traveling arc) is a device for producing a continuous train of large sparks that rise upwards. The spark gap is formed by two wires, approximately vertical but gradually diverging from each other towards the top in a narrow V shape. It was named for the "ladder to heaven" described in the Bible. When high voltage is applied to the gap, a spark forms across the bottom of the wires where they are nearest each other, rapidly changing to an electric arc. Air breaks down at about 30 kV/cm, depending on humidity, temperature, etc. Apart from the anode and cathode voltage drops, the arc behaves almost as a short circuit, drawing as much current as the electrical power supply can deliver, and the heavy load dramatically reduces the voltage across the gap. The heated ionized air rises, carrying the current path with it. As the trail of ionization gets longer, it becomes more and more unstable, finally breaking. The voltage across the electrodes then rises and the spark re-forms at the bottom of the device. This cycle leads to an exotic-looking display of electric white, yellow, blue or purple arcs, which is often seen in films about mad scientists. The device was a staple in schools and science fairs of the 1950s and 1960s, typically constructed out of a Model T spark coil or any other source of high voltage in the 10,000–30,000-volt range, such as a neon sign transformer (5–15 kV) or a television picture tube circuit (flyback transformer) (10–28 kV), and two coat hangers or rods built into a V shape. For larger ladders, microwave oven transformers connected in series, voltage multipliers and utility pole transformers (pole pigs) run in reverse (step-up) are commonly used. Exposure to an arc-producing device can pose health hazards. An arc formed in air will ionize oxygen and nitrogen, which then can re-form into reactive molecules such as ozone and nitric oxide. These products can be damaging to the mucous membranes. Plants are also susceptible to ozone poisoning. These hazards are greatest when the arc is continuous and in an enclosed space such as a room. An arc that occurs outside is less of a hazard because the heated ionized gases will rise up into the air and dissipate into the atmosphere. Spark gaps which only intermittently produce short spark bursts are also minimally hazardous because the volume of ions generated is very small. Arcs can also produce a broad spectrum of wavelengths spanning the visible light and the invisible ultraviolet and infrared spectrum. Very intense arcs generated by means such as arc welding can produce significant amounts of ultraviolet which is damaging to the retina of the observer. These arcs should only be observed through special dark filters which reduce the arc intensity and shield the observer's eyes from the ultraviolet rays. ^ EEVblog (30 October 2014). "EEVblog #678 - What is a PCB Spark Gap?" – via YouTube. ^ "Triggered Spark Gap Design". Retrieved 17 February 2019. ^ Gas Discharge Closing Switches. Springer Science+Business Media, LLC. 1990. ISBN 978-1-4899-2132-1. ^ J. J. Lowke (1992). "Theory of electrical breakdown in air" (PDF). Journal of Physics D: Applied Physics. 25 (2): 202–210. Bibcode:1992JPhD...25..202L. doi:10.1088/0022-3727/25/2/012. ^ "20kV DC power supply (homemade/DIY) using flyback with built in diodes". rimstar.org. This page was last edited on 18 February 2019, at 16:11 (UTC).